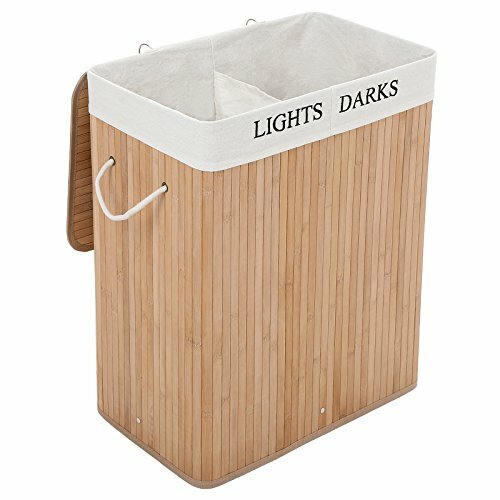 Made from durable bamboo, this laundry basket from Songmics with a natural and simple style is perfect for any room in your house! The generous 100 L capacity is great for bigger washing loads, there is a removable and washable cotton liner as wells as a hinged lid to provide a convenient way to store all your laundry and keep your home free of clutter. 1. Do not use the unit in a humid area, periodically store the product in a cool, ventilated space to prevent mildew. 2. To avoid damage to the product, please do not force clothes into the basket. 3. In order to sustain a longer service life, avoid opening the circular metal rings frequently. 4. It is recommended to wash the liner bag with water at 30 degrees Celsius. 5. Wipe the basket surface with a damp cloth to clean.